Over the past decade, the study of Canadian politics has changed profoundly. The introspective, insular, and largely atheoretical style that informed Canadian political science for most of the postwar period has given way to a deeper engagement with, and integration into, the global field of comparative politics. 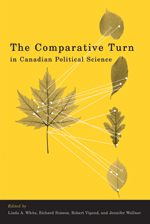 This volume is the first sustained attempt to describe, analyze, and assess the “comparative turn” in Canadian political science. Canada’s engagement with comparative politics is examined with a focus on three central questions: In what ways, and how successfully, have Canadian scholars contributed to the study of comparative politics? How does study of the Canadian case advance the comparative discipline? Finally, can Canadian practice and policy be reproduced in other countries?